Heat oil in a pan, add garlic,ginger,onion & sauté few mins. Add mushrooms & cook until golden brown. Add carrot,beans & allow to cook until half done. Add mixed capsicums,pepper powder & salt. Add cooked rice,soy sauce & mix well. Garnish with spring onion & cilantro. What a beautiful presentation dear !!! Mushroom fried rice looks good. Thats a really tempting and beautifully presented fried rice..Love it!! Fried rice looks fantastic and delicious. Wat a lipsmacking fried rice, splendid!! anything with mushroom, i am there and it looks so yummy !!! 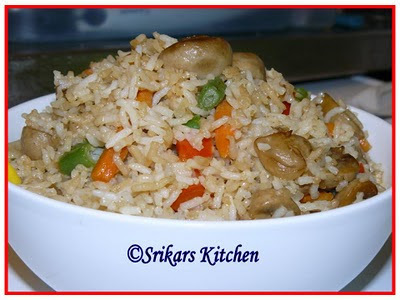 shoul try adding mushrooms..never done that to my fried rice..sounds nice..
Thats such a delicious rice dish! A meal in itself! Am drooling... I can pack it for my lunch box. Really a simple and best presentation of recipe. I like it.